So help me a lil, what things should i change or can i even use that in public? tell me your opinions, atleast you're all the real Yoshimitsu fans...But well this is the best i could do. 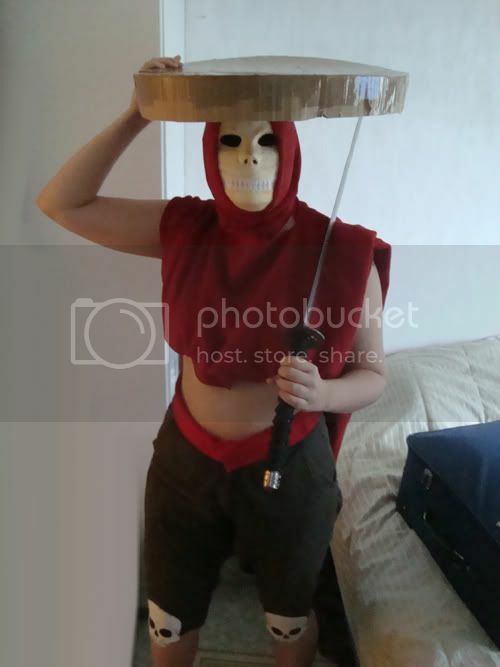 I know there is few things to do like that hat is not finished yet and i will have body paint, but is there something else? Oh yeah i forgot to put my arm protector thingies to that pic but dont worry i do have them. # Aozame32 : What do you have on your feet? I have black flip flops...it's best i found.. Cool!! Good job Nemmy-chan. Are you going to be adding to it? I don't see why you can't wear it outside, you should see how the girls dress on a Friday night here in Newcastle!! Seriously, it's fine. Way better than the one I made for halloween a few years ago. I used an oven-glove for my bionic arm. I was 'housewife Yoshi'. 'Housewife Yoshi= no plate is too hot to handle!!' Namu!! Yeah is great Nemmy! I really love it. # Nemmy-chan : I have black flip flops...it's best i found..
Hmmm... You might want to expand on that. Like, maybe you should add shin guards or something? They shouldn't be too hard to make. # SumSamurai : Yeah is great Nemmy! I really love it.